There are numerous advantages gained by lubricating electrical connectors – guarding against oxidation, fretting corrosion, contact wear and extending connector life. A thin film of lubricant can also reduce mating force by as much as 80 percent, an important factor in connector assembly. For electronic connectors with dozens or even hundreds of pins, or for automotive connectors that are in hard-to-reach places, a low insertion force makes assembly more efficient and ensures solid connections. For gold-plated connectors an effective lubricant reduces the potential for noble metal wear during mating and separation. The products discussed below are suitable for electronic/electrical applications and data connections – both digital and analogue. A guard against corrosion – Lubricants guard against oxidation and the effects of harsh environments. With gold-plated connectors this means protection against substrate corrosion. Thin gold plating can be microscopically porous and a thin film of lubricant can seal the pores, prevent substrate attack and assure low contact resistance. 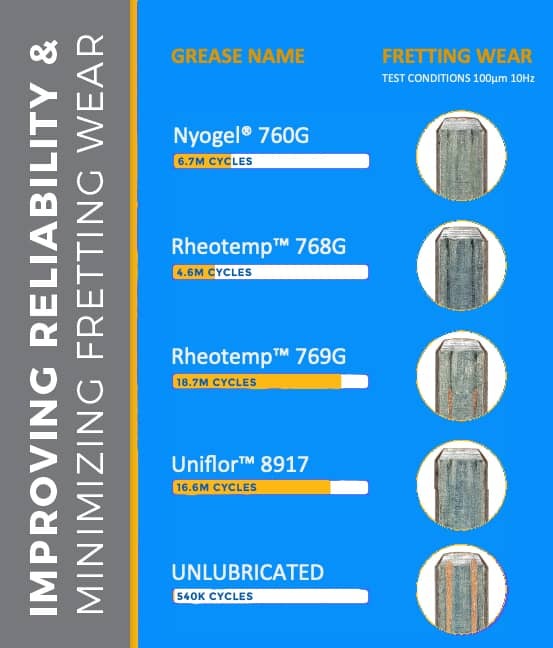 Preventing fretting corrosion – is another key ability of a quality connector lubricant. In addition to atmospheric corrosion, tin/lead connectors are also subject to ‘fretting corrosion’ which is the result of low amplitude vibration caused by thermal expansion and contraction and/or nearby motion from fans, motors/engines or anything else that causes the connector to vibrate. Fretting corrosion continually exposes fresh layers of the metal surface to oxidation, in addition to the micro abrasion and associated debris. A lubricant film minimises metal to metal contact during vibration, protecting the connector from metal wear. Take a look at the supporting information sheet Why Grease? – Facts & Myths to help understand the facts & myths associated with connector lubrication. The products discussed below are suitable for electronic/electrical applications and data connections – both digital and analogue. Also these lubricants can be used on tin, lead, copper and noble metals and are compatible with most plastics (however a test is always recommended). Have you seen our ‘Technical Support‘ website (link opens in new tab) where we have more videos, product selection guides and test videos. Please read through the table locate the connector lubricant that best matches your application/task…. 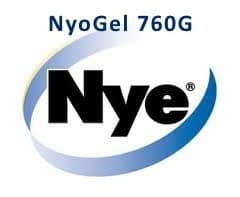 NYOGEL 760G -40 to 135 Widely used and the most cost effective product. The 'go to' grease for most connector lubricant applications. Excellent resistance to water/salt water and an effective solution against fretting corrosion, oxidation and general contact wear. Compatible with all metals including gold and silver. 760G is clear in appearance and can be hard to see in thin layers, it has a UV tracer/dye included to aid visibility in small amounts. RHEOTEMP 768G -40 to 175 The sister product to 760G, Rheotemp 768G can be considered a higher temperature specification alternative to 760G. This grease is ideal for connectors/connections located close to direct heat sources or engines/under bonnet applications. 768G has the added benefit of reducing the contact forces required to mate connectors and so is ideal for large multipin connectors. 768G also has a UV tracer/dye included. 768G is a replacement for the older formulation product called 761G. UNIFLOR 8511 -50 to 225 A heavy viscosity, completely fluorinated grease for connectors exposed to high temperatures and/or exposed to fuels or aggressive chemicals. 8511 possesses excellent thermo-oxidative stability, low vapour pressure characteristics and is ideal for hazardous environments. 8511 and 8917 have a chemistry that makes them best suited to connectors with noble metals. The products mentioned above are the more popular from the connector lubricant range. If you do not find a product that fits your needs then please contact us as we have many more formulations on file for a large variety of application types.